Things got a little too hot for rock tribute band Hairball last weekend. 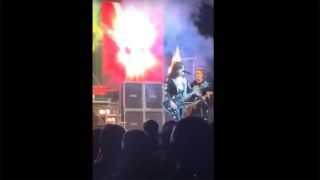 The band were playing in Sioux City, Iowa, when they launched into Kiss classic Detroit Rock City when the pyros went off… setting fire to vocalist and guitarist Bobby Jensen’s hair while he was in full Paul Stanley mode. As can be seen in the video footage below, one of his bandmates tries to put out the blaze before the road crew douse the flames thanks to some quick thinking. While the drama is going on, Jensen doesn’t miss a note – and carries on as if nothing out of the ordinary was going on. While this had never happened to Jensen before, he added: “We always prepare for it. That's why you didn't see me freak out. I have 100% faith in my guys that they'll get to me and put me out. So I just thought, 'I'll sing to everybody while I'm on fire." Hairball describe themselves on their website as “a bombastic celebration on arena rock” and pay tribute to various artists during their live shows including Kiss, Guns N’ Roses, AC/DC, Poison, Journey, Ozzy, Alice Cooper, Judas Priest, Queen and Van Halen.